In the search for pollen diagrams from NE Germany for the study of patterns in vegetation and sedimentation during the Weichselian Lateglacial it was discovered that many unpublished palynological data from the period of the German Democratic Republic are preserved in archives of research institutes. In order to save these data from sinking into oblivion and to make them available to the scientific audience, part of this material was digitalised and published (see revision of old palynological data from E Germany). One of these diagrams is from the core Cdu 82/1 from the Dubringer Moor by the late Klaus Kloss. The Dubringer Moor is one of the most important mires of the German Federal State Sachsen (Saxonia). It has been threatened for the major part of the Twentieth Century by open-cast mining, which partly triggered scientific research in order to gain knowledge on the area before it would be lost forever. Although the mire became a nature conservation area in 1972 that was expanded in 1981, it also became part of a mining protection area in 1981, and the threat by open cast mining did not disappear until the political changes in the German Democratic Republic in 1989/1990. Cross-section through the complete Dubringer Moor, modified after Vogel (1998). The Dubringer Moor is positioned along the slope of the Lausitzer Urstromtal (currently occupied by the Schwarze Elster River). 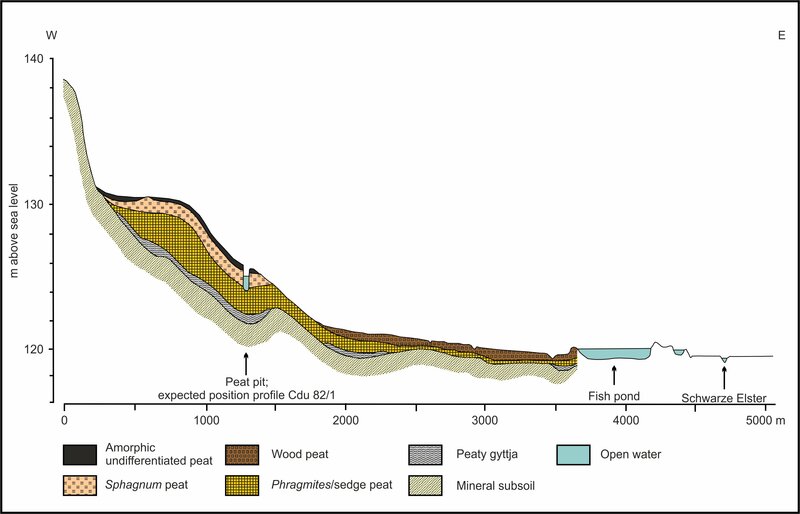 Lignite occurs already at a relatively shallow depth of 5-20 m, and its contraction resulted in the formation of several channel-like basins where peat formation initiated. The mire is surrounded by Saalian terminal moraines in the south, west and north, with an opening to the east. The western/northwestern upslope part of the mire complex consists of extensive birch carrs and bog-like patches. This part of the mire is fed by springing groundwater from the sandy moraines. The large mire complex consists of several hydrogenetic mire types that laterally grade into each other, including spring mires, percolation mires and probably some reaches with sloping mires. 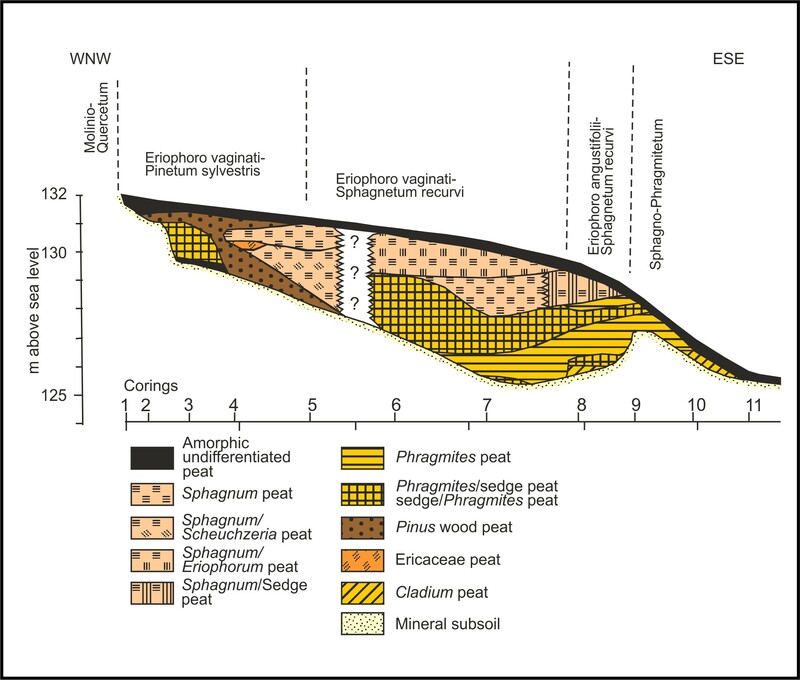 A cross-section through the highest westernmost mire area displays peat directly overlying the mineral subsoil. The basal layers of Phragmites peat grade into Phragmites/sedge and sedge/Phragmites peat and are covered with Sphagnum peat, Sphagnum/Eriophorum peat and Sphagnum/sedge peat. Pinus wood peat and Sphagnum/Scheuchzeria peat occur in the left part of the cross-section. Although this wood peat indicates prominent presence of Pinus in the mire in the past, at present only few pine carrs occur. The mire has been excessively used by humans. An important archaeological monument is a ca. 2500 year old Iron Age fortification in the south of the mire. Of more recent date are numerous ditches aimed to drain the mire, whereas also several mills around the peatland affected mire hydrology in the past. Furthermore, peat extraction has been prominent, and many small patches of open water in the northwestern area are former peat pits. The various large ponds in the east are fish farms from nearby monasteries that were initiated during the 16th and 17th centuries. Many meadows lay especially along the outermost parts of the Dubringer Moor. Cross-section through the northwestern part of the Dubringer Moor, modified after raw data os Succow (1981). Vegetation types are those of the peat remnants between peat extraction pits. The exact position of the palynologically analysed section CDu 82/1 is unclear. Kloss (1990) mentions its location in the southeastern part of “Abteilung 313” at the margins of a large peat pit, and the approximate position could be estimated with great likelihood. The pollen diagram covers the final time-frame of the Weichselian Lateglacial and the complete Holocene, however with a small hiatus. The pollen types produced by trees show the development of the forest vegetation on the dry grounds surrounding the basin as well as the development of carrs within the mire. The pollen types of wetland plants illustrate the development from a fen to a bog-like habitat. Edom, F. & Wendel, D. (2008): Moore in Sachsen. In: Naturschutzgebiete in Sachsen. Sächsisches Staatsministerium für Umwelt und Landwirtschaft, Dresden: 49-58. Jorga, W. (2000): Das Dubringer Moor. Oberlausitzer Familien-Kalenderbuch 2001: 83-86. Karneth, S. (1990): Zur historischen Gebietsentwicklung im heutigen Naturschutzgebiet „Dubringer Moor“ und dessen enger Umgebung. Abhandlungen und Berichte des Naturkundemuseums Görlitz 64: 37-41. Kloss, K. (1990): Beitrag zur Moor- und Vegetationsgeschichte des Dubringer Moores, Kreis Hoyerswerda, nach einem Pollendiagramm. Abhandelungen und Berichte des Naturkundemuseums Görlitz 64: 33-36. Neumann, E.E. (1990): Die bodengeologischen Verhältnisse des Dubringer Moores Inventarisierung und Hinweise für die Arbeit im Naturschutz. Abhandlungen und Berichte des Naturkundemuseums Görlitz 64: 27-31. Pietsch, W. (1985): Vegetation und Standortverhältnisse der Heidemoore der Lausitz. Verhandlungen der Zoologisch-Botanischen Gesellschaft in Österreich 123: 75-98. Pietsch, W. (1990): Pflanzengesellschaften und Standortverhältnisse im Naturschutzgebiet „Dubringer Moor“. Abhandlungen und Berichte des Naturkundemuseums Görlitz 64: 43-49. 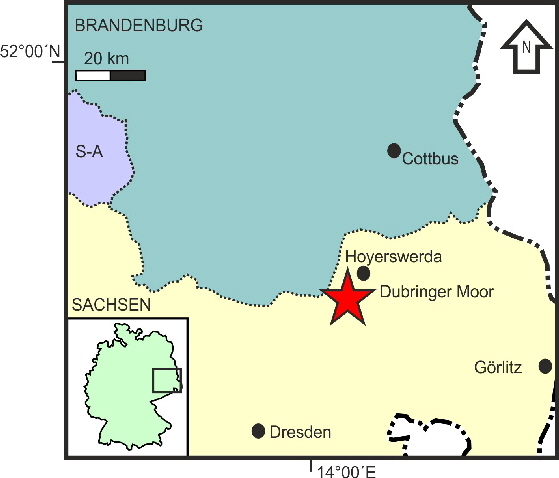 Seifert, M. (1995): Die Vegetationsentwicklung des Dubringer Moores. Report, Sächsisches Landesamt für Umwelt und Geologie, Freiberg. Succow, M. (1981): Landschaftsökologische Kennzeichnung und Typisierung der Moore der DDR. PhD-Thesis, Eberswalde. Succow, M. (2001): Durchströmungsmoore. In: Succow, M. & Joosten, H. (eds. ): Landschaftsökologische Moorkunde. E. Schweizerbart'sche Verlagsbuchhandlung (Nägele u. Obermiller), Stuttgart: 365-378. Vogel, J. (1998): Das Dubringer Moor. Staatliches Umweltfachamt, Bautzen/Naturforschende Gesellschaft der Oberlausitz e.V., Görlitz. Vogel, J. (2008): Dubringer Moor. In: Naturschutzgebiete in Sachsen. Sächsisches Staatsministerium für Umwelt und Landwirtschaft, Dresden: 146-153. Wetzel, G. (1992): Die Siedlungsgeschichte im Kreis Hoyerswerda bis zum Mittelalter. In: Hoyerswerda, Geschichte und Geschichten aus Dörfern und Städten. Geiger-Verlag, Horb am Neckar: 22-31. Zscharnack, G. (1992): Das Naturschutzgebiet Neudorf-Dubringer Moor. In: Hoyerswerda, Geschichte und Geschichten aus Dörfern und Städten. Geiger-Verlag, Horb am Neckar: 70-81.